Sorry I haven’t been posting much lately… Joe and I are in Guatemala! Though the place we’re staying has a small kitchen (no smaller than MIT! ), we’ve been eating out nearly every meal. Last weekend we went on a little excursion to the Caribbean via Rio Dulce – a huge, beautiful river fed by Largo Isabella, the biggest lake i have ever seen. 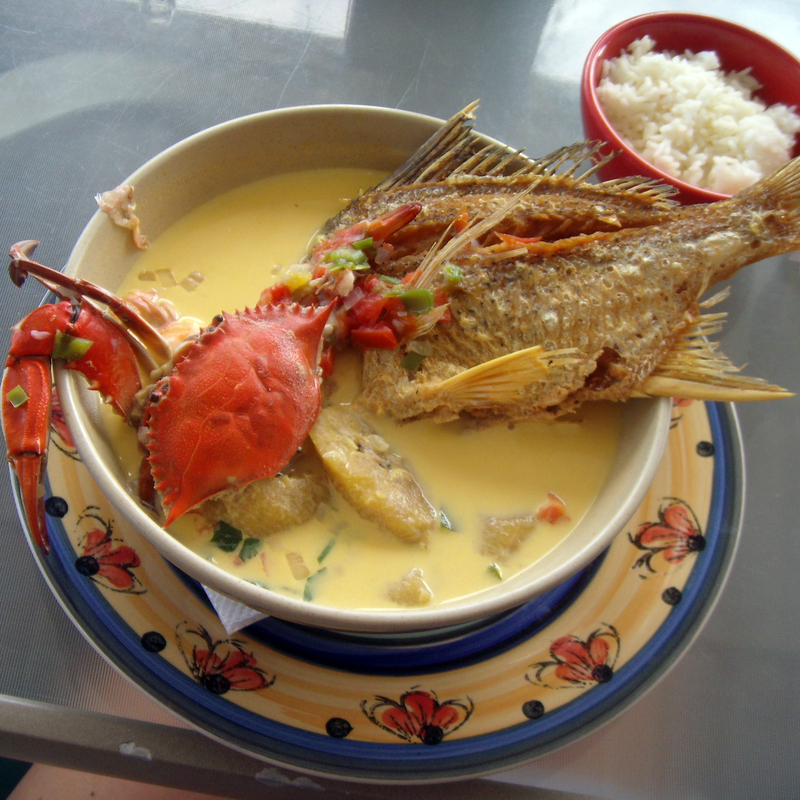 Along the way, in Livingston, I sampled a traditional soup called Tapado. It’s a coconut milk based seafood stew with spices, plantains and whatever seafood the kitchen has on hand. Mine had lots of shrimp, a whole crab and fish (as you can see). I just love the way his – ahem – the crab’s claw dangles outside the bowl. Don’t eat salad out. If your dish shows up with lettuce on top, just push it to the side. Get a hotel with a kitchenette so you can eat veggies at home. Bring bug spray to Playa Blanca (beach flies were a little annoying). Inspired by a recipe from David Lebovitz. He made some lovely Apricot Jam. I just lessened the sugar and used some wild blackberries that I found while wandering around London. Combine water and sugar in a sauce pan and stir over medium heat until sugar is completely dissolved. Add the fruit (blackberries) cook, uncovered, skimming off any foam that rises to the surface. As the mixture thickens and reduces, stir frequently to make sure the jam isn’t burning on the bottom. When the jam looks thick and is looks slightly-jelled, turn off the heat and put a small amount of jam on the chilled plate. Put back in the freezer for a few minutes, then do the nudge test: If the jam mounds and wrinkles, it’s done. If not, continue to cook, then re-test the jam until it reaches that consistency. Once done, ladle the jam into clean jars. Cover tightly and let cool to room temperature. Once cool, refrigerate until ready to use. Storage: I find this jam will keep up to one year if refrigerated. If you wish to can it for long-term preservation, you can refer to the USDA Canning Guidelines for techniques. I am taking a little break from the kitchen as i just nearly broke my ankle in a bike accident. I was riding my bike home from the grocery store (of all places) and a car door opened right into the side of me. One of my biggest fears since we have moved to Cambirdge and started biking everywhere was running into a car door. I have had a few close calls, but this one was perfectly timed so there was no avoiding it. It was flung open into my body and knocked me into the street. I was laying on the yellow line. Thank heavens there was no oncoming traffic. So now my right ankle is very swollen and has two punctures from my chain ring. I pray that I will be back to running on it in a week or two… the marathon that I have been training for all summer is in 3. We won artwork at the MIT student art loan! We got a print of Yoshitomo Nara’s ‘In the Floating World Gold Fish’ (#37/50) to keep in our apartment for a year. It retails around $3,880 so hopefully we don’t mess it up! 090902 – Washington Post Published! Unfortunately the link to my blog was not included, but I am still very excited to have my picture in the Post! i’m considering submitting this one to failblog.org… this was our hotel room window. we quickly became the talk of the hotel after a car smashed into our window at 10:30 p.m.
Not to brag, but my dad and i are killer sandcastle makers. We have been honing our skills for about 5 (?) years now, and each year we seem to attract more and more spectators. Above are all our castle making tools. In the bag, and perhaps most essential, is my dad’s metal spatula used for carving away sand. I sometimes use the plastic one, but the sharper metal edge makes a much cleaner cut. We use scrap wood both as scaffolding (to displace our weight and allow us to stand higher up on the sand pile) and for evenly packing down the sand for the base of the castle. You can also simply pack the sand with your hands. Here, my dad adds sand to our mixing bucket then carefully scoops the wet sand into piles to later carve away into a tower. a road around the castle base. it was the PERFECT evening for a picnic. we rode our bikes down to Oranoco Park by water in Old Town. I don’t have any new recipes to share in this post, but want to encourage everyone to get outside for dinner. Food tastes better in fresh air. We ate the same things as we did for our indoor picnic, but it was all much more enjoyable. Pretty soon i hope to post a camping trip – complete with recipes!